When I was visiting school gardens and school garden advocates in the Bay Area, one of the places I visited was Life Lab in Santa Cruz. Located on the campus of the University of California at Santa Cruz, Life Lab is a national leader in the garden-based learning movement. They have an outstanding garden curriculum and offer garden experiences for kids as well as workshops for educators. Their outreach director, John Fisher, who I met at the National Farm to School Conference this summer, has recently co-authored a book with Whitney Cohen, the education director at Life Lab. 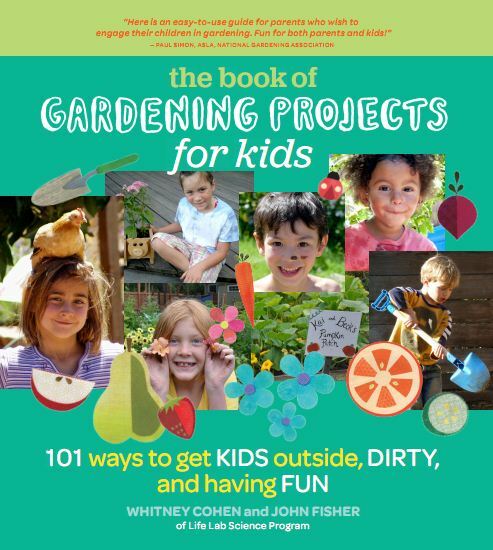 It’s titled, The Book of Gardening Projects for Kids: 101 ways to get kids outside, dirty, and having fun. The book is aimed at parents and, as billed, is filled with ways to get kids outside in the garden and having fun. While it covers the basics like how to plan and build and maintain a garden, including various kid-themed gardens, it is more about gardens as spaces where kids will want to play, hang out, and just by being there, learning about the natural world. Many of the gardens pictured in the book have me thinking about redoing some of my own outdoor spaces, and my kids are grown up! It’s obvious that the authors know kids as well as they know gardening. What child wouldn’t want to race sow bugs, build fairy houses or make sculptures out of mud? That’s not to say that there isn’t a lot of learning that will go on while following these activities as well. This book would be a great resource for teachers of in-school or after school garden classes as well, which is probably how I will use it the most. As a final note, I loved the sidebar story of Katie Stagliano. When Katie was in the third grade, she was given a tiny cabbage seedling at school that she planted in her backyard. The resulting cabbage weighed out at over 40 pounds when it was time to harvest it! Katie and her family decided to donate it to the local soup kitchen and then ended up staying to help serve the soup it went into. Katie was inspired by this experience and has gone on to oversee multiple gardens that serve the soup kitchen…to the tune of 2,000 pounds of produce a year! You never know what the interest piqued in growing a single seedling will lead to. You can learn more about Katie at: katieskrops.com.